PetroHab, provider of Hot Work Safety Enclosures (HWSE), has announced the official launch of its state-of-the-art ATEX certified Safe-Stop™ automatic shut down system. Designed and manufactured in Dundee, Scotland, the Safe-Stop Modular Shut Down System (MSDS) works in conjunction with the 100% US-made pressurised Petro-Habitat HWSE to provide unrivalled safety whenever hot work is conducted in the vicinity of potential flammables, such as in ATEX Zone 1 rated hazardous areas on oil rigs and at refineries. By continuously monitoring the pressure inside the Petro-Habitat HWSE, the Safe-Stop MSDS enhances the Petro-Habitat’s safety by only allowing hot work to be conducted inside the HWSE if the air pressure within it exceeds the air pressure outside of it, thereby creating what is often referred to as a “positive pressure environment”. This serves to prevent unwanted flammable gases from entering the enclosure, which allows hot work to be safely undertaken in the Petro-Habitat, without the need to shut down the facility where the hot work is to take place. 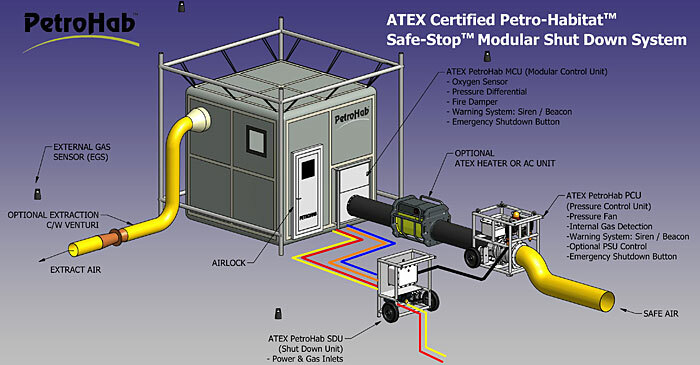 PetroHab’s economical ATEX certified Safe-Work™ Modular Control System (MCS) provides a safe work environment within Zone 2 rated hazardous locations. This system is integrated into the Petro-Habitat in the same way as the ATEX Zone 1 rated system, but eliminates the extra services, and costs required for Zone 1 rated areas. PetroHab further offers custom integrated DNV 2.7-1 transport containers that are designed to neatly and securely fit all the components of PetroHab’s Petro-Habitat HWSE, Safe-Stop MSDS, and Safe-Work MCS. PetroHab is exhibiting at stand 574 at OTC.